I started this painting several months ago. I was determined to create a large abstract painting to hang in my bedroom on a big blank wall. 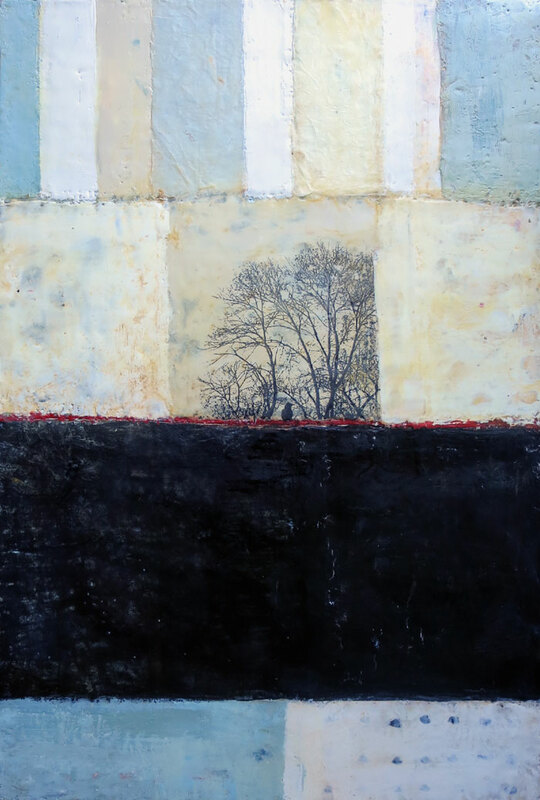 24×36 inches is a large size for me, especially in encaustic and so it takes me a long while. I’d work on it here and there, but for a long time I stalled on it. And it sat in my studio with a reproachful look whenever I glanced that way. This week I finally got back into the studio I pulled it out and onto my table and committed myself to push it along. And when I was finishing up another painting, I decided that I would add one of my photo transfers to it and then I knew I’d finish it. I came back the next morning and it was done. I am drawn to the inherent beauty and spirit of the natural world, and my artwork is a personal dialogue that reaches into the stillness of that spirit. Through both imagery and medium, I create organic pieces that speak to the cycles of life, growth and decay, memory and the passage of time. My artwork aims to reveal the beautiful melancholy and the fragile imperfection of the life around and within. I wrote the above several years ago, but it’s still true. I’m still on that path. It’s important in all that we do, but especially if you are an artist, to listen to that voice within and follow it. So I still don’t have a big abstract painting for that blank wall in my bedroom. Ah well.